Mr. Float Cabin Goes "Up the Lake"
Well, maybe not all the way up the lake. 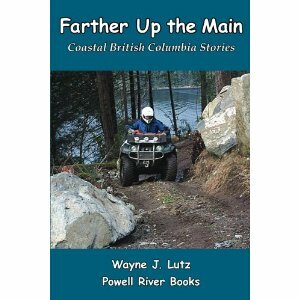 If you are in Powell River and want to meet the author of Coastal BC Stories, come to the Shinglemill Restaurant at the Powell Lake Marina. You will find our trusty bookmobile called Mr. 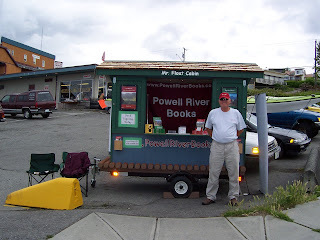 Float Cabin, Wayne and me at the head of the boat launch dock answering questions and signing books from Friday evening through Saturday afternoon. 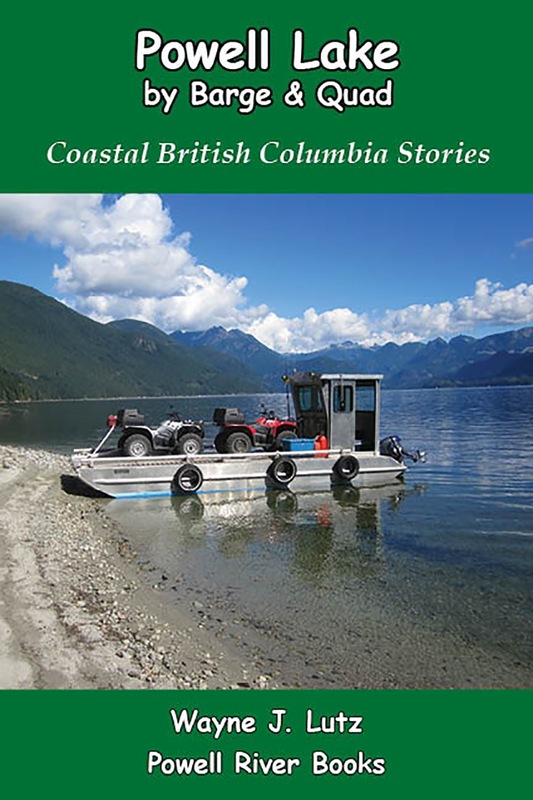 All titles in the Coastal BC Stories series are $19.95. PhotoCD are $4.95 (a dollar off), and Powell Lake T-shirts are $9.95. Powell River Books will pay all applicable GST and PST if anything is purchased at this special Canada Day weekend sales event. 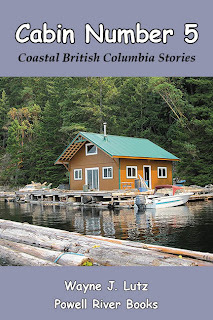 If you can't make it to the Shinglemill, you can purchase all Coastal BC Stories titles from our trusted partners Amazon.com and Lulu.com. Visit www.PowellRiverBooks.com for more ordering information. When we need to leave our float cabin on Powell Lake and come to the States, we have a condo in Bellingham, Washington. It's handy, close to the border, and where my mother lives. While it isn't as close to nature as our cabin, we do have a creek behind our building. There are lots of trees and bushes for birds and critters. My second floor balcony is like a bird blind that I can use for viewing and photography. I was sitting on my sofa and heard a strange sound. First, I thought it was my cat crunching his "cookies," but discovered it was coming from outside the window. When I glanced out, I could see small objects flying through the air. As I traced them back to the source, I saw a Pileated Woodpecker chopping the heck out of a dead tree snag. The more he pecked, the more the wood chips flew. I knew it was a Pileated Woodpecker by its large size, black colouring and distinctive red topknot. They are common to our area, but it is the first I've seen. After he worked for a while, he stuck his head inside a nearby hole. He obviously was gobbling up some ants or insects he had dislodged and sent scurring into his makeshift bowl. Yum! Today was a very important day. I got to meet my blog's most faithful reader, Betty, in person. Betty has been reading my blog for months, even when she had to use a slow dial-up connection while visiting her sister in Nevada. Now that's dedication. Betty has had a very interesting life, including living in a remote cabin in Montana. She can relate to many of the things I write about in Float Cabin Living. 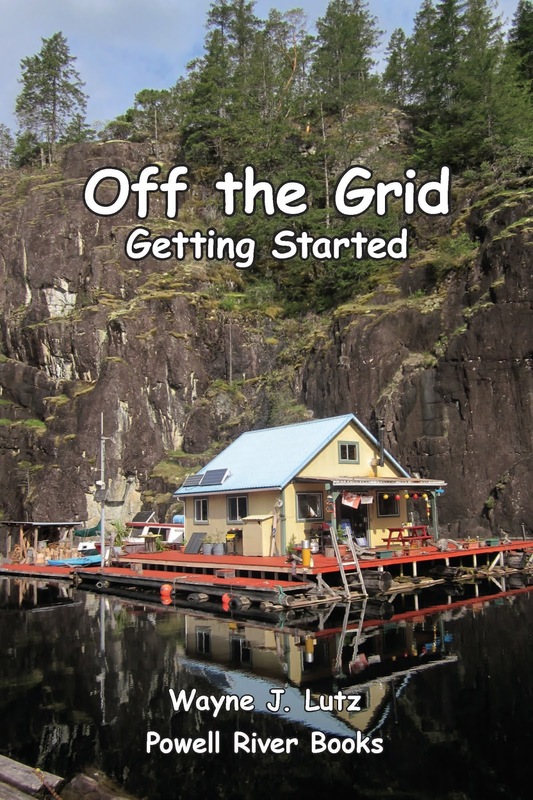 Her cabin was on land, but it was off-the-grid and used propane like we do. She also worked at Bellingham Airport and even took some flying lessons. Go Betty! Betty is the first person from the Internet that I've met in real life. We set up a rendezvous at Village Books in nearby Fairhaven. It has three nice coffee shops, and we chose the Colophon Cafe. Over coffee and some really tasty desserts, we learned even more about each other. Betty and I have another connection. Her good friend is Auntie Dot, who is the aunt of Captain Bob from my rendition of The Night Before Christmas. We didn't discover this until after my "Meet Captain Bob" post. As you can see, it truly is a small world. I look forward to many more visits with Betty when I'm in Bellingham now that we've connected in real life. I'm an avid sky watcher, especially at my floating cabin on Powell Lake in British Columbia. This year I have been fortunate to get some solar halos pictures. In early June I saw one while sun bathing on my back deck, a pleasant surprise. 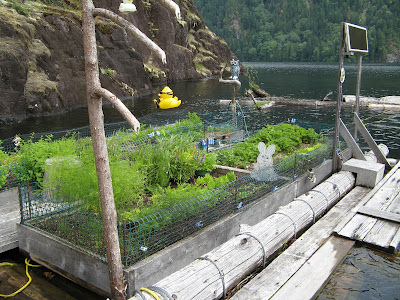 From previous posts, you may already know about my floating vegetable garden. It's given me great veggies each summer for the last four years. This year I am trying potatoes in a barrel. Better Homes and Gardens had an online video that intrigued me. I planted Norland red seed potatoes at the bottom of a barrel. Each time they sprouted, I covered the leaves with more dirt until the barrel was full. I was a little skeptical, but the hearty plants kept pushing themselves farther up through the soil. I won't know for awhile how the potatoes turn out, but if the plants are any indication they should be great. My asparagus was great from May through June. Lettuce, spinach, radishes and onions give us great summer salads. I'm trying beets for the first time and they seem to be doing well along with my carrot crop. To get more space for my veggies, I'm using pots this year. My zucchini is already starting to produce, and the tomatoes and peppers are getting a good start. Gardening is something that makes me feel good. It gets me outdoors, gives me some exercise, and helps cut down on the amount of food we have to haul up the lake to our cabin. We were pleased to see a pair of Barn Swallows return this year to build a nest under the peak of our roof. Last year's attempt had a disastrous end. After a week of building, the nest fell and the pair disappeared for the remainder of the season. I don't know if it is the same pair, but somehow I hope so. I know Barn Swallows build mud nests in some locations, but here it is a mixture of mud and grasses. They pick the most precarious spots to build their nests. The one under our roof has no support other than a 1/2 inch ledge of wood near the eves. Somehow they are able to concoct a substance sticky enough to hold everything up straw by straw. After dark, our float cabin deck becomes an astronomical observatory. On clear nights, Wayne sets up his Meade 8" Schmidt-Cassegrain telescope for nocturnal sky and star gazing. Winter nights are the longest, but often cloudy. Summer nights are clear, but short. Last night we were also battling the moon's bright glow. The moon is an interesting object to explore, so we took advantage of the early evening hours to gaze at the craters and get some pictures with my digital camera. It isn't very sophisticated, a Canon PowerShot A710IS, but I was able to get a few good pictures through the telescope's lens. After our moon shots, we headed off to bed. To get the darkest possible sky, we set the alarm for 1:00 a.m. There would be a very short window of time after the setting of the moon in the west and the rising of the sun in the east. 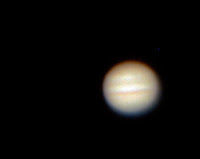 Typically, Wayne gets up alone for these late night/early morning observations, but last night I joined him to try and get some pictures of Jupiter. My planet shots weren't as successful as my moon pictures, but I'm pleased I was able to get anything. The Vancouver Aquarium was recently excited to announce the birth of a baby beluga whale on Tuesday, June 10. The new baby named Qila entered the world on live video for the world to watch. The Aquarium continues to have a live feed from the whales' tank so you can watch all the action. In my post yesterday, I announced the "birth" of a whale of a different kind. The "birthing" process began with an empty propane tank that floated into Hole in the Wall. It was discovered by our good friend John. After a year without any claimants, he agreed to give it to us. It was extremely rusted, especially below the water line. Wayne's first task was to sand the entire tank to get rid of the loose rust particles and blisters. The next step was to prepare the metal surface for painting. Fortunately, we found a half-priced can of metal primer at the local Rona store. They have a great section if "mistints" to choose from. Because we wanted to protect the entire tank from further corrosion, Wayne had to roll it over and tie it up to get at the bottom. The next step was to paint the entire tank with a white base coat of rust-resistant paint. Because we had the primer underneath, no rust have leaked through. Once the white coat was dry, it was time to decide what to paint on the tank. We had several ideas: a submarine with waving passengers, a salmon, and even Ogopogo, the monster of deep lakes. The winning design was a fanciful whale. Again using rust-resistent paint, Wayne coloured in the design until the form of the whale emerged. Painting while the tank was in the water was a little problematic, and periodic rains didn't help either. The left and right sides aren't exact duplicates, but that adds to the character of our whale. Our newly "born" whale is now part of the boom in front of our cabin. He performs two important tasks. First, he welcomes passerbys to the Hole with a great big grin. Second, he helps cut down the wakes from their boats so that we can keep welcoming smiles on our faces as well. In Wayne's book Up the Lake, there's a chapter called "Save that Nail." It tells about how we are careful to wisely use the things we have. Our cabin is ten miles up the lake and can only be accessed by boat. Consequently, we use and re-use everything as much as possible. Winter storms blow items from cabin decks and send them afloat. Two such items have come our way and found a new use. The first was an old dinghy. It was damaged beyond repair but has found new life for wood storage. 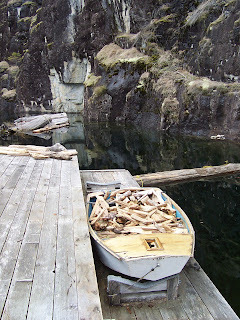 Small pieces of floating wood are collected and placed in the boat to dry. Our second find was a large, rusty propane tank. It was empty and probably used for flotation under a cabin. After a year with no claims, Wayne scrubbed off the rust, gave it a good coat of primer and painted it to decorate the front of our log boom. We intend to periodically change the theme, but the first reincarnation is a whale. Today was roof "party" day at the Westview Flying Club. About fifteen volunteers from the Flying Club and the Powell River Car Club joined together for a clubhouse re-roofing project. To save a little money from the Club's treasury, we decided to do the removal ourselves. Then next week, a commercial roofer will come in to finish the job. Dale coordinated the efforts of the crew. While the brave of heart climbed up top to remove the screws and aluminum panels, I assisted below stacking the old roofing on pallets. The Club will recycle everything. It's good for the environment, and it might bring in a little extra cash. Once the old roof was down, it was time to put up tar paper. To make it easier, the lengths were cut on the ground so they could be lifted to the roof. That was the end of the easy part. A good breeze, especially on the west side, made placement and nailing quite a challenge. We got back to the cabin last weekend and found our log boom had broken a cable and was floating at an unusual angle. Our log booms (used for boat wake protection and to mark our water lot) are connected to shore and a deep cement anchor using thick steel cables. As strong as they are, they rust over time and weaken. As we pulled the boom back into place, the other cable gave way. In times like this, who ya gonna call? Boom Busters - no, our friend John. We tied the whole mess up until he could bring us some new cable and the tools needed to make the repairs. He makes everything look so simple. Wayne and John headed out in our tin boat. John could only get enough cable to fix the front entrance. For the longer back entrance, we temporarily used rope and a handy tree snag for a connection. When the cable comes in, we'll make a permanent attachment to the rock wall. One good thing, it didn't happen during a wind storm. We could have lost our precious logs! Another good thing, it helped us better understand how the boom is constructed. Our log boom is L-shaped and is attached to two rock walls with steel cables and eye-bolts set in holes drilled deep into the rock. At the point of the L, a large cement anchor was dropped to the lake floor at a depth of over 100 feet. It's a good thing that didn't break loose! We discovered Texada Island as a flying destination in the 1980s. Almost every year, we would pack up our Piper Arrow 997 and head for British Columbia for a summer of fun and sun. Texada Island has a campground right on the airport just for pilots. Now, Texada Island is part of our ocean view from the condo in town. Recently I went of a flying photo tour for a local magazine, Powell River Living. Texada is known for its natural resources. Here is what remains of an old iron mine. I see beauty in the winding roads and concentric rings heading down into the earth. Here is the village of Gillies Bay looking over the Strait of Georgia to the snow capped Coastal Range. Shelter Point is a great day or camping destination if you visit Texada Island. On the July 12-13 weekend, Van Anda, a now quiet but former mining boom town on Texada Island, will be having a special Heritage Society sponsored Van Anda Days. 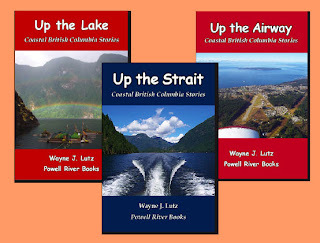 Included will be a Texada Island (Gillies Bay) Airport Fly-in on Sunday, July 13, with your's truly, my husband Wayne, giving slide presentations about his new book Up the Airway.